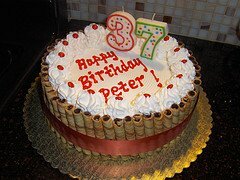 Here is a 37th Birthday cake idea that you could do for any year, just put the number on top. This cake has something else that is neat, which are the treats around the cake, held in place by a ribbon. Join in and write your own page! It's easy to do. How? Simply click here to return to Cakes.